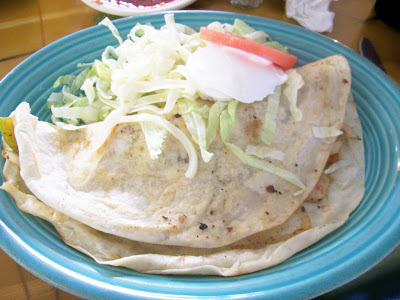 I decided on a Shrimp Quesdilla. 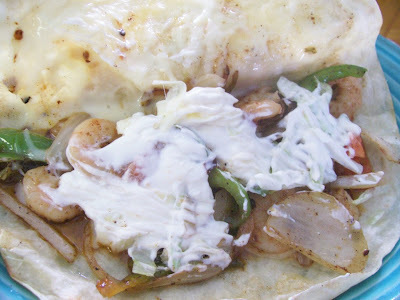 Marinated shrimp griddled with green bell pepper and onions then put in a flour tortilla with cheese and griddled again served with sour cream, tomato and lettuce. I consider this the best Mexican restaurant in town and they are busy busy even without an alcohol license even though they are trying again. Skillet shots are tough for me. Most of these went south on me for this recipe. I will just have to talk through it. 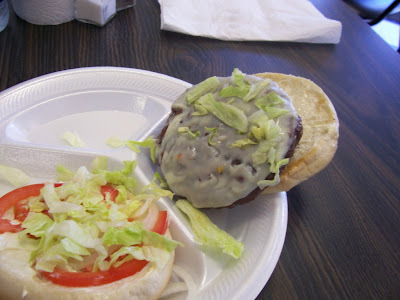 First you brown the ground beef. 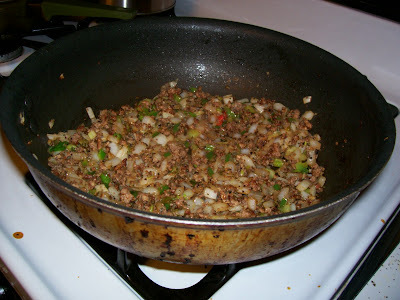 Below is the seasonings added. 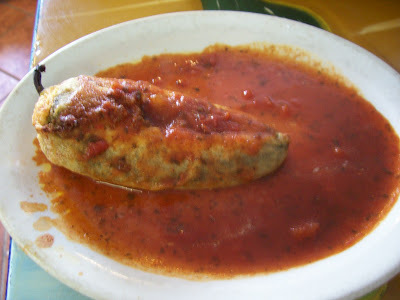 The way my mother made this was to make an eggplant base cooking down eggplant with seasoning and ground beef. Cooked rice was add to this. The above way works perfectly fine also. It has a nice eggplant flavor which I love and pretty hefty spice kick due to cayenne pepper. 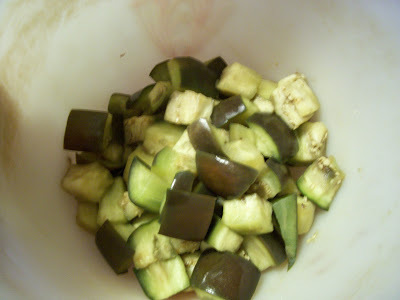 The eggplant disappears leaving the skin which just melts in your mouth with an additional eggplant flavor. 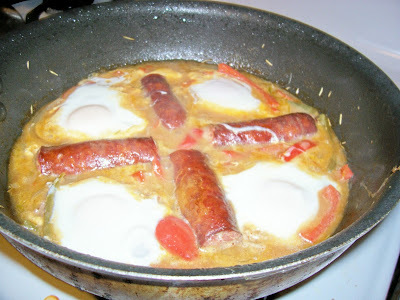 Again a very simple and easy recipe although it does contain a couple of steps. 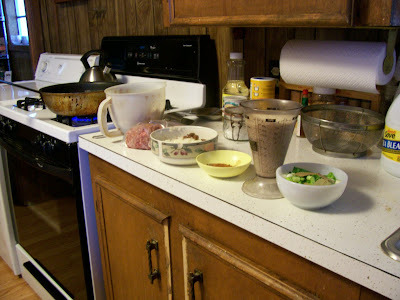 Here is the ingredients in the rice pot. 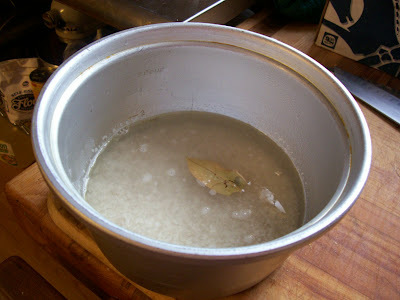 Rice, water, bay leaves and very little salt. I was skeptical but I went with anyway. Here is the finished product. In many restaurants today the people are trying to cut back on salt by not putting any in rice. 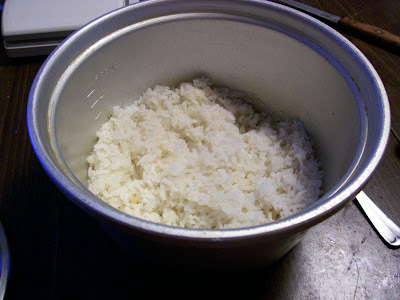 This results in bland rice. Although I only put about an 1/16 (pinch) in this one it was delicious. 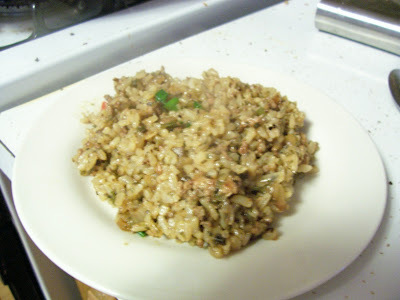 I would have had some with butter if I had not needed all of it for the Dirty Rice. I will be making my rice with bay leaves from now on. It was sorta of an herbal backnote that I found pleasant. 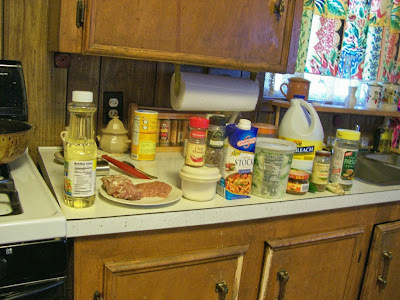 Ingredient line up for Dirty Rice. 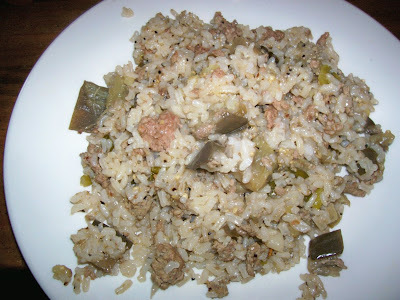 The cooked rice was added to that along with chicken stock and green onions and parsley. Finished product below. Nice spice level due to some jalapeno in the seasonings. 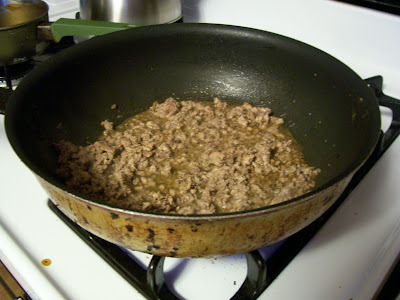 When I was growing up dirty rice was made with ground beef not only because my paternal grandfather ran cattle but because my mother had high blood pressure. Back in those days the common wisdom was that pork exacerbated the condition. 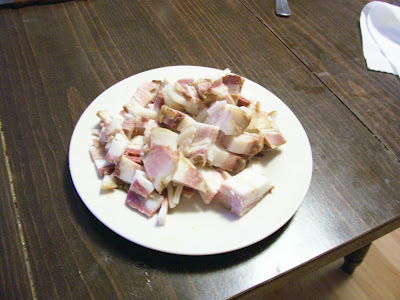 So I rarely got to eat pork except when I went to my maternal aunt's and uncle's houses. Maybe that is why I like pork so much. Because it was such a treat for me. The procedure for this recipe gave a deep roasty toasty flavor to the final product. 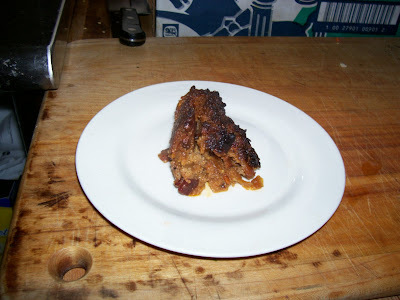 Since the liver was pureed it just added a richness in the background without being to livery. Good recipe with good directions. Located in the Bronco Stop this establishment seems to have broken the curse on this site. They tried out different times until settling down to their current venue. One thing they eliminated was lunch. I had a particularly fine shrimp stew before they switch to dinner hours only. This is a family owned and run restaurant and boil house. Some menu items are family recipes. Service is casual and homey with no frills i.e. 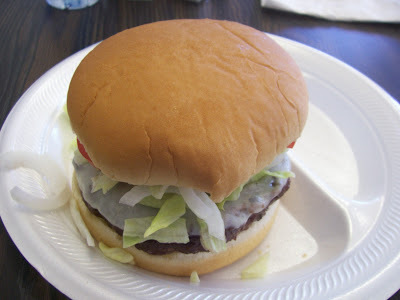 Styrofoam. With the new tables it exudes a camp on the bayou feel. Their Corn, Crab, and Shrimp Bisque is more like good macque choux. 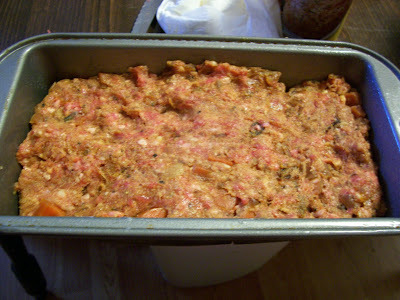 Thick with no cream or roux it contains loads of corn, tomato and seafood with great flavor and a spicy kick. 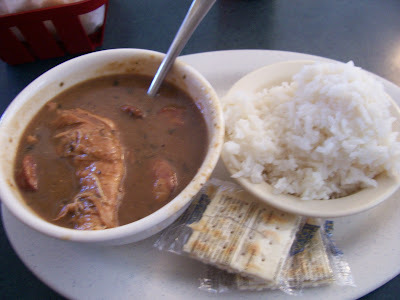 The Seafood File Gumbo also contains no roux and has lots of crab and shrimp. It seemed to me that the file had been cooked into the broth. It gave it a weird appearance although the flavor was good. One time I ordered some raw oysters and marinated ones. For the raw I received shucked oyster in a Styrofoam bowl. A bit unusual but it tasted fine. 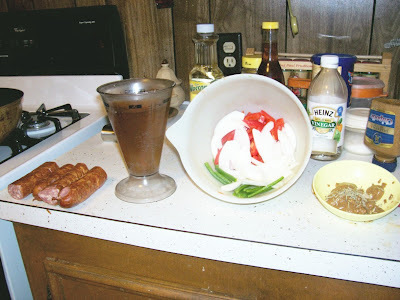 The marinated ones consisted of raw oysters in Italian dressing with sliced raw onions, bell pepper, and jalapenos. They could have benefited by a longer soak. 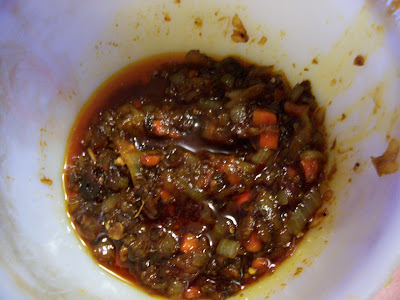 However the marinade had picked up some lovely oyster flavor. I crumbled crackers into it after eating the oysters, delicious. I ate their Seafood Platter next. It had shrimp, oysters and catfish on it. The coating were appropriate to the seafood i.e. 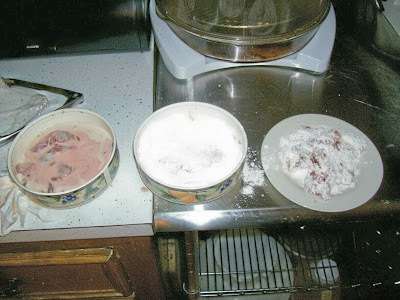 shrimp -flour coating, oysters and catfish -corn meal. The catfish was especially good. They do seem to have a slight problem with some of the pre-made products they use. The hush puppies were undercooked and the onion rings slightly overcooked. I am sure they have that down pat by now. 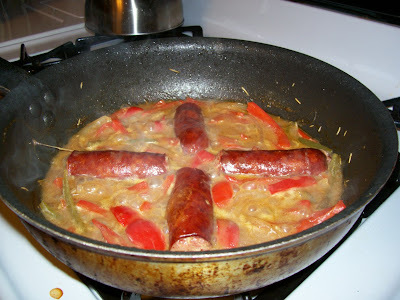 Ok I probably made more substitution on this recipe than any before and have add a twist. Calls for amber beer but I could not get a single bottle of amber so I went with regular beer. 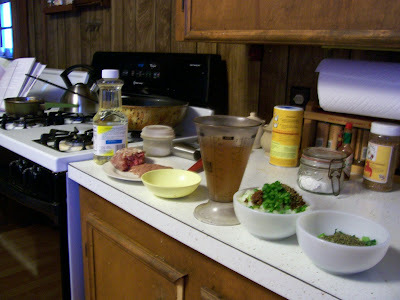 Called for red wine vinegar but I used Steen's cane vinegar. Since the amber comes from roasting the malted barley and adds an undernote of sweet, I felt the Steen's would do that. It calls for grain mustard and I thought I had some. 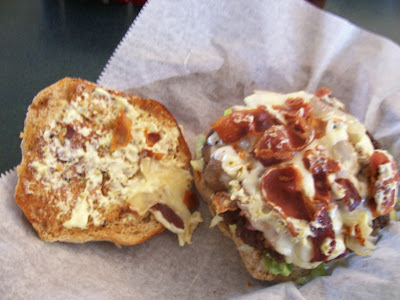 Turned out not but I had some chipotle mustard. Since I was using Mowata Store (Bubba Frey) sausage which a nice smoke on it and jalapenos was in the recipe, I thought it would dovetail nicely. By the way it did. 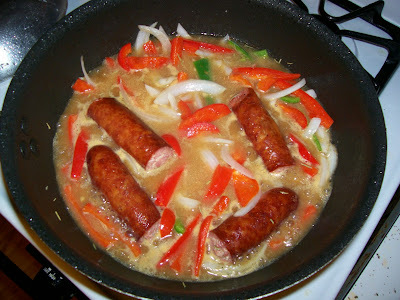 The sausages were wonderfully tender and tasty with the vegetables having great flavor and spice with a tangy undertone. Would have gone fine with rice. 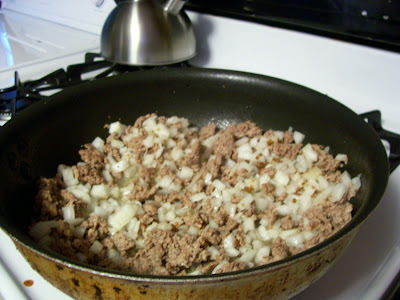 Again simple straightforward directions for a marvelous variation on smothering meat. 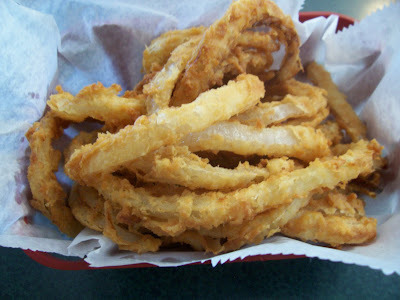 Wonderful onion rings. Medium cut with a flour coating and not greasy. Believe it or not this is an half order. I would hate to see what a full order would be like. It could probable feed 6 people. Then the spices, sugar, ketchup, and Worcestershire go in. 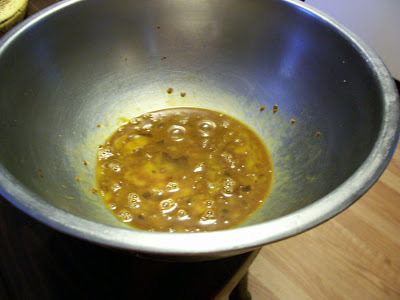 Again cooked for 5 or 10 minutes at simmer to incorporate and thicken. Here is the result. You now let this cool. I had to store it overnight as the package of meat that I took out of the freezer and defrosted was not ground meat but some sort of tips. Below is a package of grass fed beef that my cousin and I went in on. By the way our goat should be ready soon. 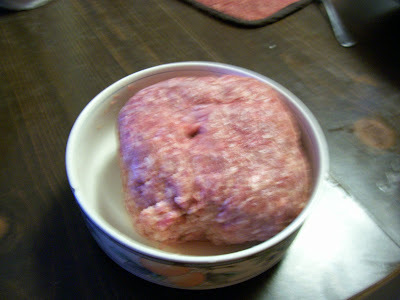 This is ground chuck. 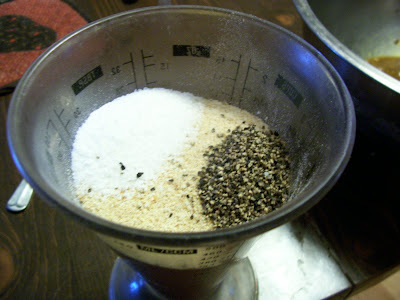 The dry side with bread crumbs and spices. 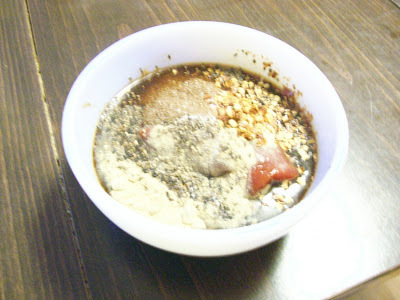 The result of mixing all three together along with the flavoring base. Stashed in a loaf pan. I then foiled it and cooked for an hour in my tabletop convection/light technology appliance. At that point it was 150 degrees. I unfoiled it and browned the top. It came out easily and here it is. Because my dice was probably larger than it should be and I probably used more onion than called for the loaf just after cooking fell apart when I tried to slice it. I happily ate in chunks. Did I mention it was delicious. After a night in the frig it sliced just fine. Most of this loaf went to work for some people to sample. I have enough for a sandwich I have not gotten too. This recipe makes two loaves so the other one is stashed in the freezer for a later date. 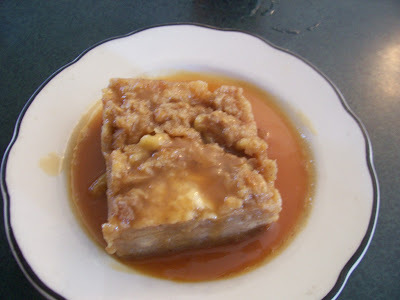 While the recipe has a fair amount of ingredients it can easily be made in two stages. 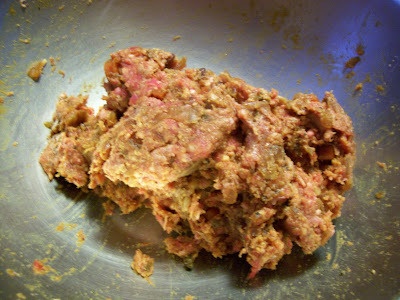 Making a cooked flavor base delivered a smoky flavor through out the meat loaf as predicted by Chef Link. 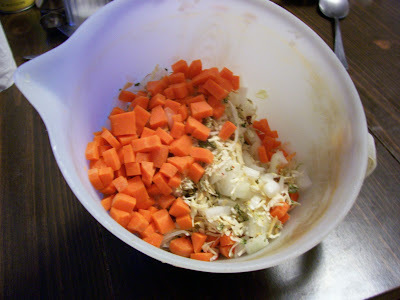 It also had a nice spice kick with beefy flavor and just a hint of sweetness from the carrots. In other words balanced. A keeper although I will adjust some of my prep methods the next time I make. Here is a batch ready to go in the fryer. 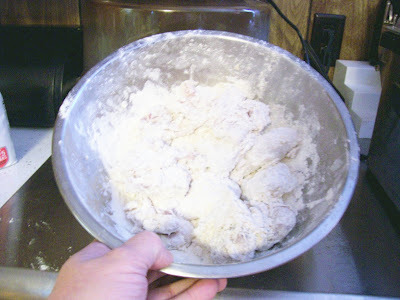 I floured up just enough for a batch. 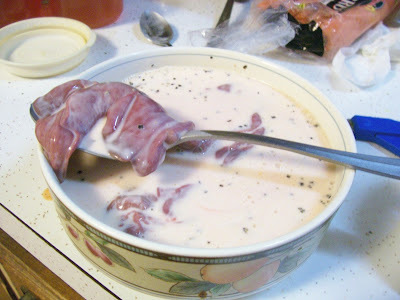 Did not want the flour sitting on the livers. I used my tabletop fryer to do this not crowding the basket. They took about 4 minutes because turkey livers are larger than chicken liver. Below is the a couple just out of the fryer. I found they are best eaten while a little warm. After they have sat awhile they are not so good. I am sure this is because the liver is mostly fat and a little congealed when cold. This recipe lays it all out in a simple and direct way. 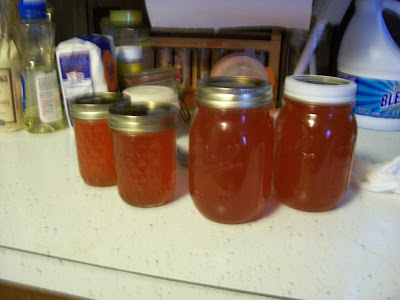 An easy recipe to follow especially if you already have the jelly. If you like the dish at the restaurant these are exactly the same. Something to pass around at a party as long as you are doing them fresh. 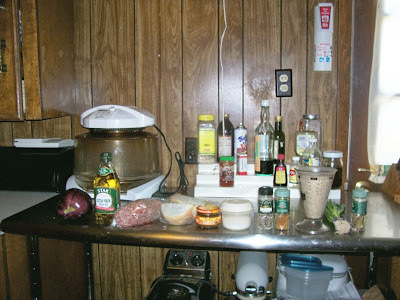 This a recipe that is a component in another recipe. 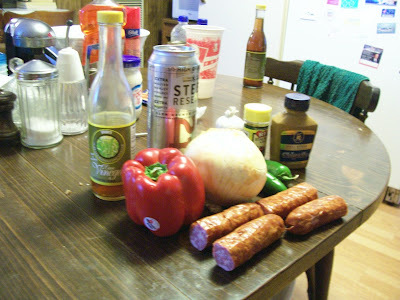 Here are the main ingredients. I varied them a little bit. 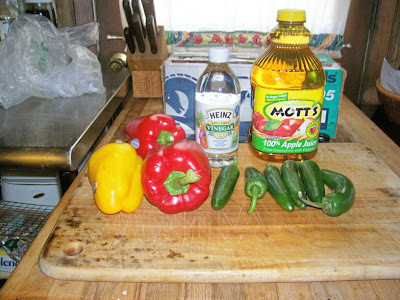 I have more bell pepper and less jalapeno. I like spicy food but not burn my taste buds out hot. 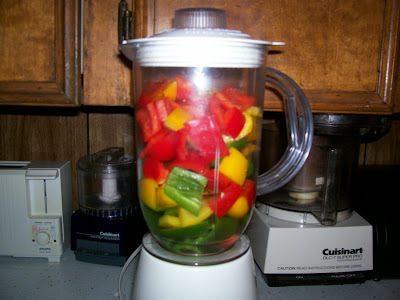 After chopping up the peppers they get pureeed in the blender. 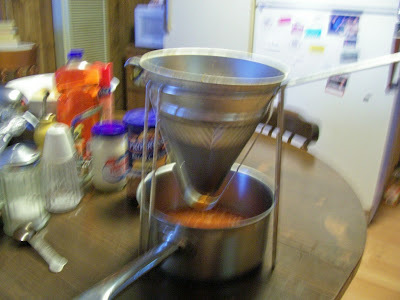 Then they sit overnight in the frig to macerate and the liquid to take on the taste and heat of the peppers. 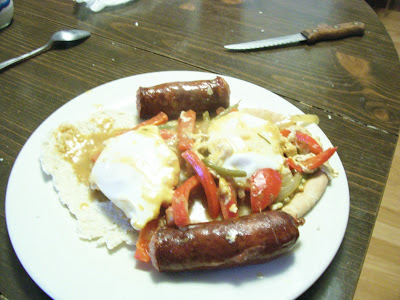 Chef Link has just written and released a cookbook called Real Cajun (Rustic Home Cooking from Donald Link,s Louisiana). I received a press copy and so as my tribute to local man made good for the next month or so I will be cooking out of it and letting you look over my shoulder. These days I rarely follow a recipe exactly but I will let know when I deviate. 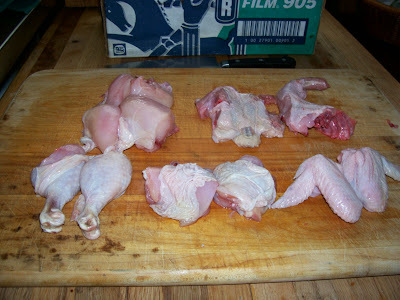 Below is a small yard bird that I bought at farmer's market. It is probably only 2 lbs whereas the recipe calls for a 3 to 4 lb bird. The cut on it follows the recipe (breast cut in 4 pieces) except I have added the back cut into two pieces. This is how my mother did it. The back were her special pieces. As I have said before and will probably say again she was a bone sucker a trait I pick up from her. Best tasting meat is bone in. 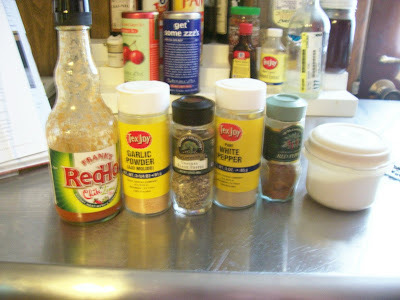 Below is the spices added to the chicken pieces which were then tossed and left to sit overnight. 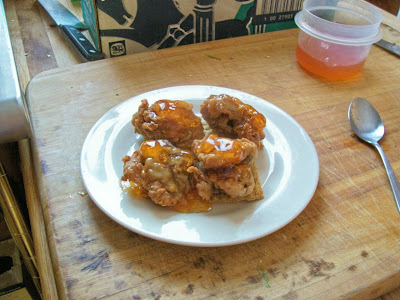 The chicken was then soaked in buttermilk. I let mine sit in the frig for another hour after that. The recipe does not call for that I just did it. 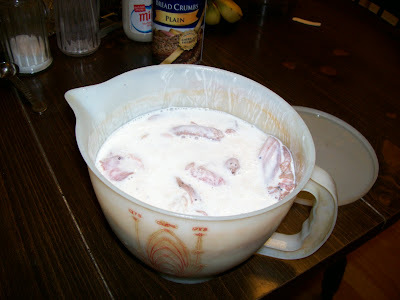 The pieces were taken out of the buttermilk allowing excess liquid to drip off. 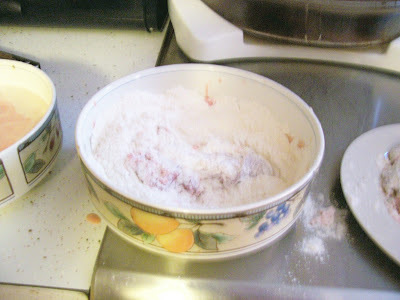 When all were in the clean bowl all purpose flour was added and the pieces tossed to coat. 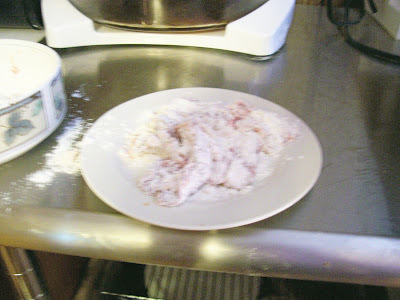 They were then piece by piece taken from the flour and shaken to remove excess. 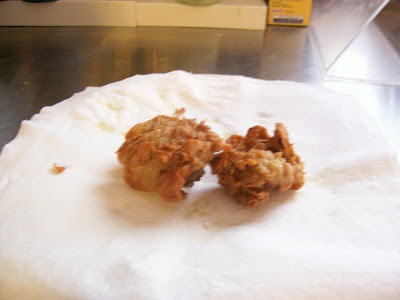 Mine went into a stove top fryer to be deep fat fried with vegetable oil. Since they were small pieces they took only 10 minutes. 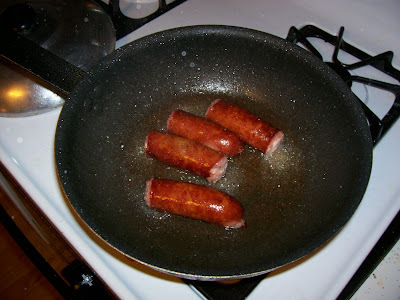 The recipe calls for them to be pan fried in a black iron skillet preferably with lard or bacon drippings. 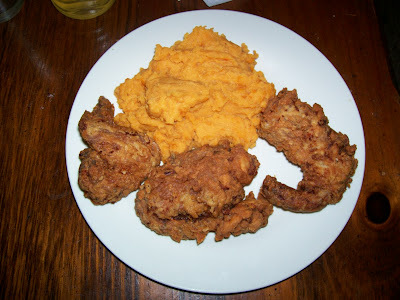 The back and a wing with a sweet potato mash made with whole milk buttermilk was my meal. The next day cold chicken from the frig. My assessment of the recipe if that it clear,well thought out and simple to follow. 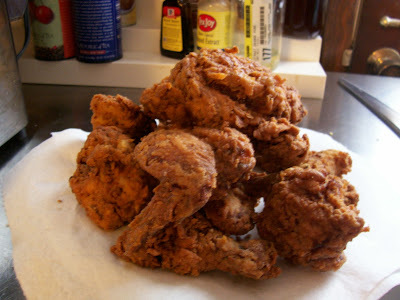 The resulting product is well season chicken meat with a sturdy crunchy crust. This one is a keeper. 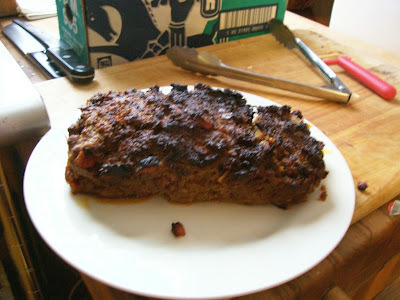 The overnight contact with the spices and hot sauce left the meat tasty. The crust was perfect. If you want a little more umph to the crust I recommend adding some hot sauce to the buttermilk and soaking at least an hour.